Periodically let Emma listened to the CDs with me or I filled her in on the plot as the two books on CD progressed. Then with book three, I decided to try "reading" one of her books and took it with me on a weekend trip I was making with my family...I finished a 700 page book in two days. The way she writes makes it very easy to read. I ended up reading the last three chapters aloud to my daughter and I remember sitting on my bed with her sobbing at the turmoil Bella was going through...I was convinced at that time that I was a JACOB fan and not Edward. But book 4 changed my mind and all is right with the world. Emma and I were part of the many crazy fans that stood in line at Walmart at midnight the night the book came out to buy it. We then read it aloud to each other...I however, secretly read ahead of her by myself (to edit the parts that might have needed editing for an 11 year old)...and I finished the entire book in a few days...so I actually read book 4 twice! My entire reason for writing this post was so I could show off a layout I did of some pictures you've alreay seen of Emma. 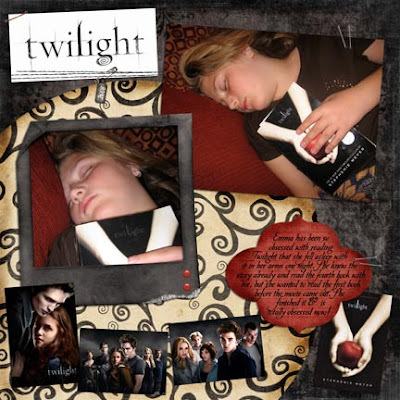 They're the ones where she fell asleep on the couch hugging her Twilight book. Well I played around with some Shabby Princess designs and created this layout below...isn't it cool (hope you like it Emma).